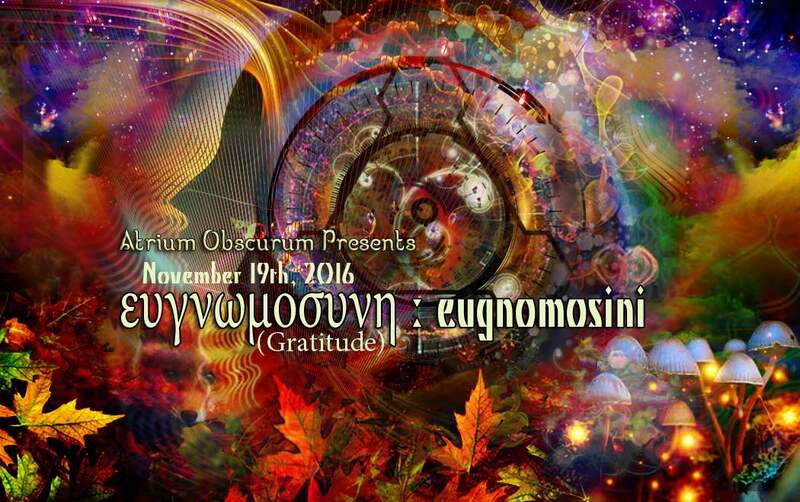 Atrium Obscurum Presents "Ευγνωμοσυνη (Gratitude)"
Be thankful for your mistakes. They will teach you valuable lessons. Be thankful when you're tired and weary, because it means you've made a difference. It's easy to be thankful for the good things. A life of rich fulfillment comes to those who are also thankful for the setbacks. Gratitude can turn a negative into a positive. Find a way to be thankful for your troubles, and they can become your blessings. Come and join us for an evening of dance, workshops, food, and vendors. This is a potluck so please bring a dish to share or a piece of fresh fruit to add to the fruit salad that will be served in the morning! Please know Divine Sight is a yoga and dance studio that is allowing us to use their sacred space so no shoes will be allowed in the dance space. We will have place for all of our shoes and will have a sock hop on the dance floor! 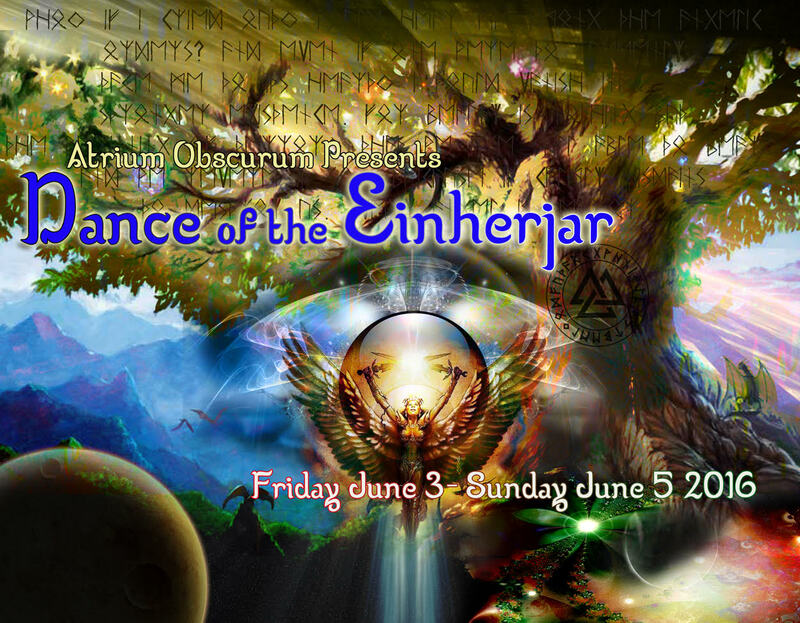 Atrium Obscurum Presents "Dance of the Einherjar"
Hello fellow travelers. It's been a long odyssey since we began walking the road with this community so many years past. Last year, many of those dear to us in this family reached the end of their road in this life and started a new journey. We have known much pain and grief for our loved ones who have started their new quest. Alas, where there is death, there is also life, and those who have died are never truly gone as long as we remember them in our hearts. The Norse people called those who’ve lived good lives and who’ve passed “Einherjar”, which means “the Honored Dead”. They live forever in the halls of the Gods, in Folkvangr with Freyja, and in Valhalla with Odin. Every day and night they celebrate; drinking, feasting, fighting, and loving each other as they watch over and protect their mortal descendants. This summer we invite you to celebrate those honored dead. Celebrate their lives and memories with us in a revelry that will shake the gates of Valhalla! Come and join in the Dance of The Einherjar! 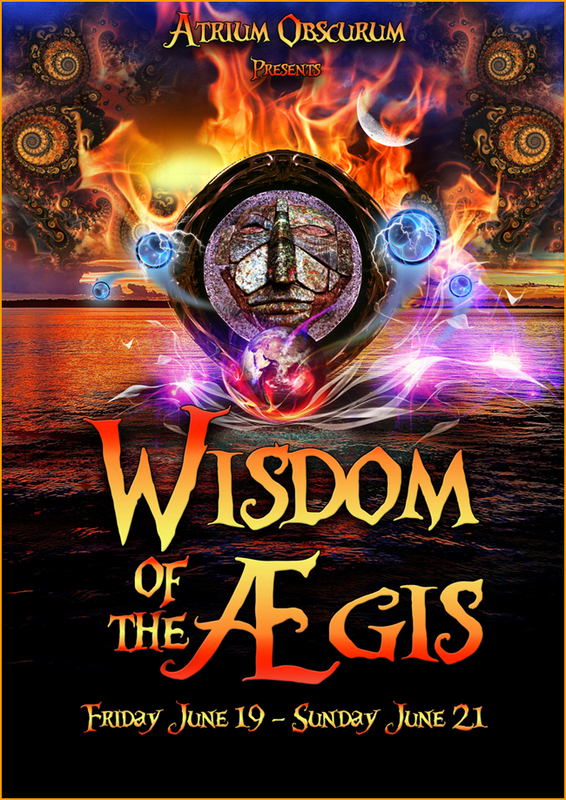 Atrium Obscurum Presents "Wisdom of the Aegis"
As humans have continued to learn and grow as a race, we have accomplished tremendous feats of the mind and engineered impressive creations. As much as our evolution has given us, we must not allow our hearts and minds to stray from the lessons of old. For many of us, present times and transitions require that we must come to understand the natures of our immortal and infinite protectors. This means that for the rest of us who have shared communion with these benevolent beings, you must now embrace the confident humility you have spent so long cultivating and lead us through the teachings of time - open the doors of ancient mastery to shed the illuminating wisdom of our ancestors upon us! Whoever you are and wherever you stand, it is now vital that we all pursue a conscious initiation into the secrets that guide and regulate this universe, it’s material mechanics, and the limitless potential of energy. If humanity should lose touch with it’s roots, we would cut off our reach into what lay before us. Equipped with the insight of our Earth's antecessors, our intuitions will guide us to accomplish this crucial task we were born here and now to achieve. Consider this invitation a patronage to your emerging era, as well as a vote of confidence and trust in your ability to carry the torch of knowledge for this stage of it’s journey through time. From even before the days of Olympians - when the Shield of Athena, goddess of wisdom and strength, protected the forefathers of modern philosophy, literature, science and mathematics - it is, was and always will be the passing on of knowledge that sustains our species. With guidance and dedication, a strong understanding of the past will prepare us to face any of the future’s challenges. As we master our egos and humble ourselves to the truth, we can foster the holistic education of our complete selves in our physical, spiritual and conscious bodies; lower, higher, and in the spaces between until that which reigns above aligns with that which dwells below. "To command and to be commanded is the fruit of education, and unity and confidence is the result." 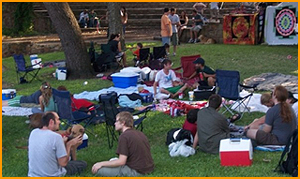 - Emperor Haile Selassie I.
Atrium Obscurum Presents "Park Party/Potluck"
Location: Trinity Park Shelter House The shelter house is facing W.7th st. You can park on the side street of the park where Chuys is. Bring a dish to share We will have tables set up in the shelter house with electricity for those who need a crock pot or etc. Kiddos welcomed as always. We will have a few games set up for the kids to play. Also don't forget to bring a cardboard box for them to be able to slide down the big grass hill on! 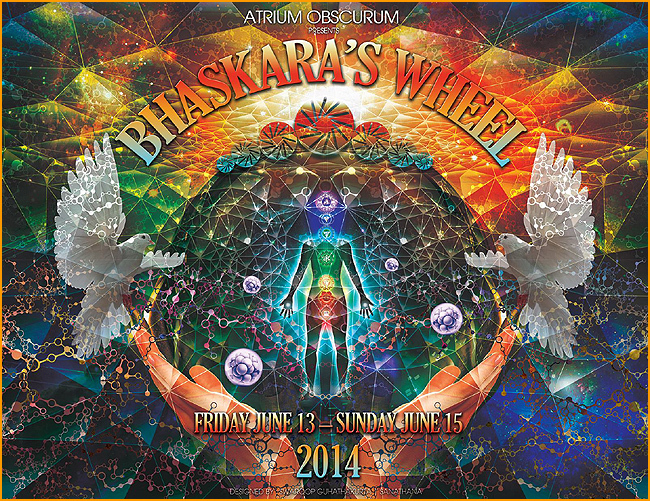 Atrium Obscurum Presents "Bhaskara's Wheel"
Perpetual motion. Wouldn't it be nice? For centuries, mankind has endeavored to master it. From the first attempt by Bhaskara to the modern day variations, one thing has remained the same: There is no free lunch. Technology... gravitation... thermodynamics… quantum mechanics… Our tools and our understanding are at unprecedented levels today. And yet, perpetual motion still eludes the mainstream. One reality remains: keeping things moving takes work. As enticing an idea as it may have appeared, Bhaskara's Wheel did not provide the world with free lunch. But it did provide a valuable metaphor. And a valuable lesson. And so it goes with our new philosophical, metaphysical and spiritual modes of operation and understanding. Will we one day be able to grow in understanding and acquire new knowledge, then simply push our inner wheel once, allowing the new concepts to keep it spinning perpetually with some cleverly placed intention, thought, and emotion, never having to consciously revisit those concepts? Perhaps. The future is unwritten. Today, in our current human iteration, like Bhaskara and his wheel, we have not yet truly mastered this luxury. We must face the reality, in this moment, that in order to maintain the momentum and trajectory of our spiritual, philosophical and metaphysical evolution, we must consciously maintain the machine. We must continue to combine intention with action, lest the wheel stops spinning. So join us, fellow engineers and explorers. Join us in our familiar landscape while we celebrate what we have learned and connect with the obligation we have to ourselves for keeping ourselves on our paths. Come enjoy the many sensual fruits of some fellow wayfarers as we dance to the aural and visual delights they have gifted to the world, and get some good camping and R&R in while you’re at it. Come join us as we consciously keep those Wheels spinning! Atrium Obscurum Presents "Invisible Cities"
Join us to dance, to play, to share stories of our travels to lands far & wide, and to bring new landscapes to life. Your experiences and travels through life have assisted in shaping your landscape. 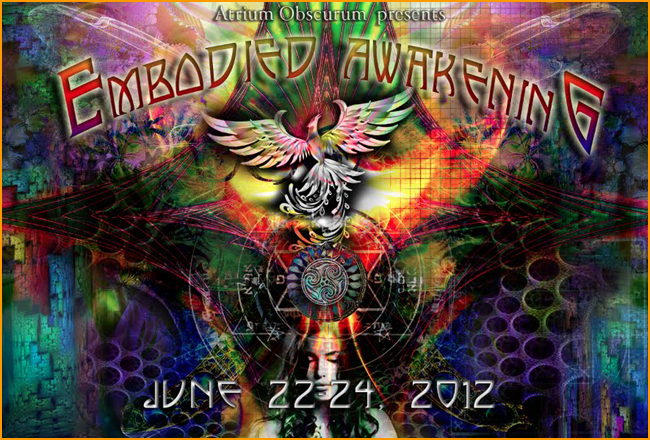 Bringing forth a myriad of different thoughts, perceptions, modes of being, and so much more. The simple act of sharing these with another has the ability to shift worlds and to sprout new life, new growth. During this weekend we have the chance to share through music, art, dance, and so many other ways. Atrium Obscurum "Legends of The Fall Park Party and Potluck 2"
Come and join us again this fall for the Atrium Obscurum Legends Of the Fall park party and community gathering! The intention of this day time fall festival is for our community to come together to play,dance, hula hoop, play games, and participate in some of the workshops and potluck that will be given. 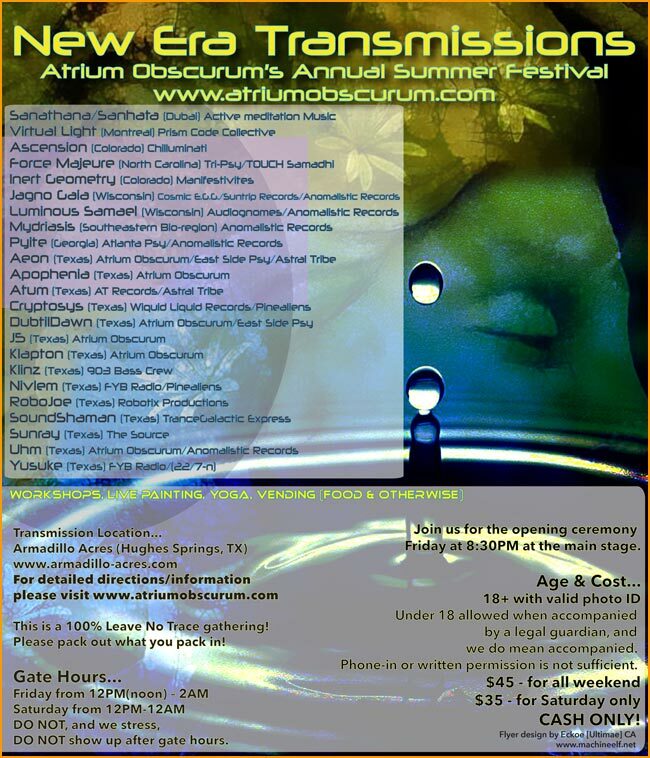 Atrium Obscurum Annual Summer Festival "New Era transmissions"
Greetings wayfarers and beings of light. We send this transmission in good faith and with good tidings. We bring you a special message from the Sacred Celestial Well. We welcome you into this new era of understanding. 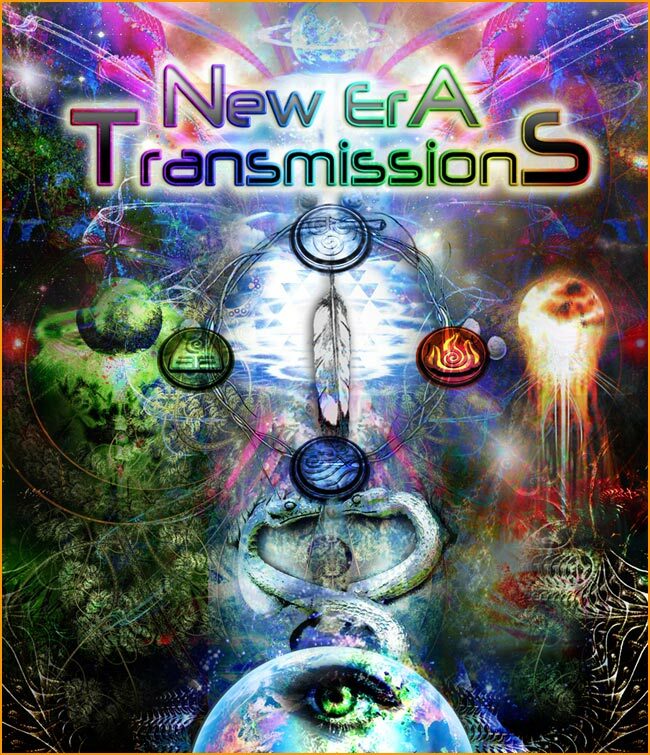 We invite you to assemble with us as we embark on the newest phase of our collective journey through the cosmos and through the ethereal realms. 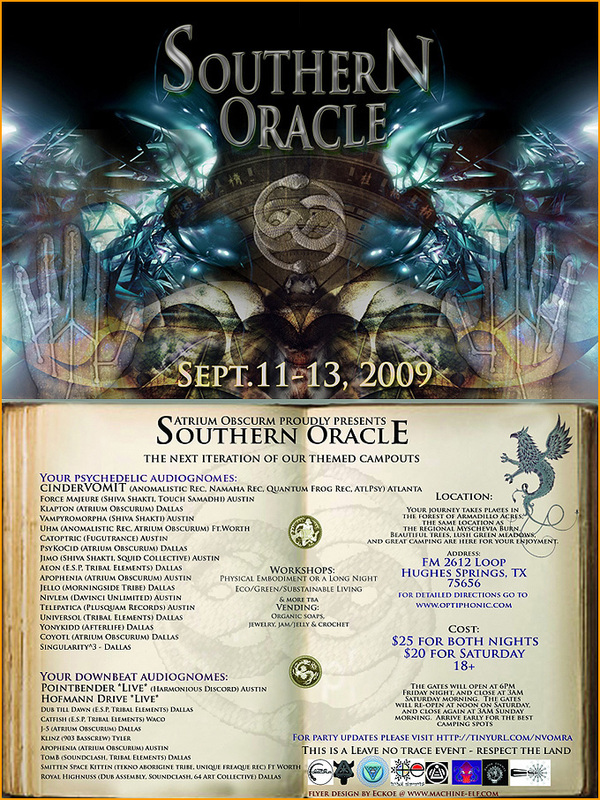 The time is drawing nigh for convocation of souls, and we would be honored to add to the symphony of spiritual vibrations your resonant frequencies while we navigate with and among each other along the surface of our Gaian host in the Sacred Forest. 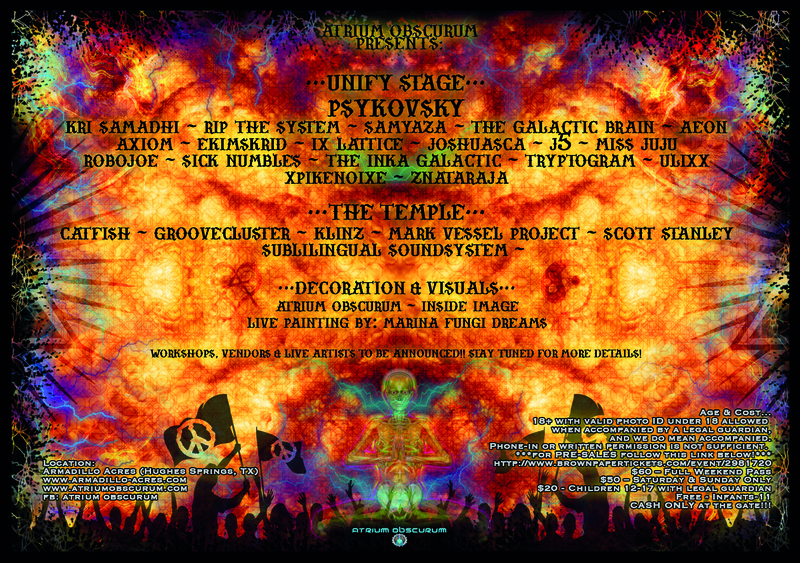 Please join our conscious collective as we imbibe a variety of psychedelic visual and aural delicacies and dance beneath the stars that have danced before us for time immeasurable. Come collaborate, enumerate, elaborate, debate, relate, negotiate, and stay up late. Most of all, COMMUNICATE! For this is the mission that has been bestowed upon you. We have entered a New Era. Your mission, should you choose to embark upon it, is to lay low the ramparts that have kept your inner glow within the confines of your sacred castle and kept it from illuminating the Universe. Tune in to your deepest harmonic vibrations and let them spiral up through your being and out through the gift of the resonant voice you were given. Seek out other articulated waveforms of expression and weave them into your own internal symphony wherever they resonate within. Shed the old, intricately woven insulating sheathing that has kept your electroluminescent core from moving the flux of the world around you. Your mission for this gathering and this phase of our journey through the New Era, is to share yourself with the Universe and with those you love. Say the things you could never say. Express the things you could never express. Love the way you never dared to love. Live the way you never dared to live, and share the experience far and wide. Let your soul free and let all who are near know how free it is! And so, fellow wayfarers and beings of light, this concludes this important New Era Transmissions communique. You now have the assignment. Should you choose to carry forth, we will be eagerly awaiting your unique sound signature at the epicenter of our launching pad. You will know it when you see it. You will know it when you hear it. You will know it when you know it. 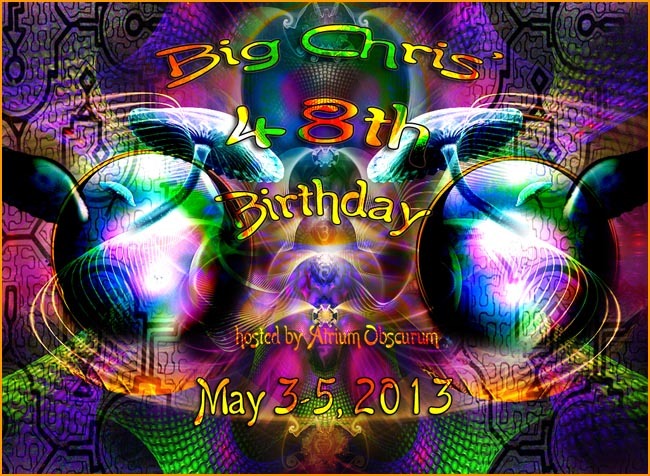 Our friend and long-time member of psychedelic trance community, Big Chris, is turning 48. 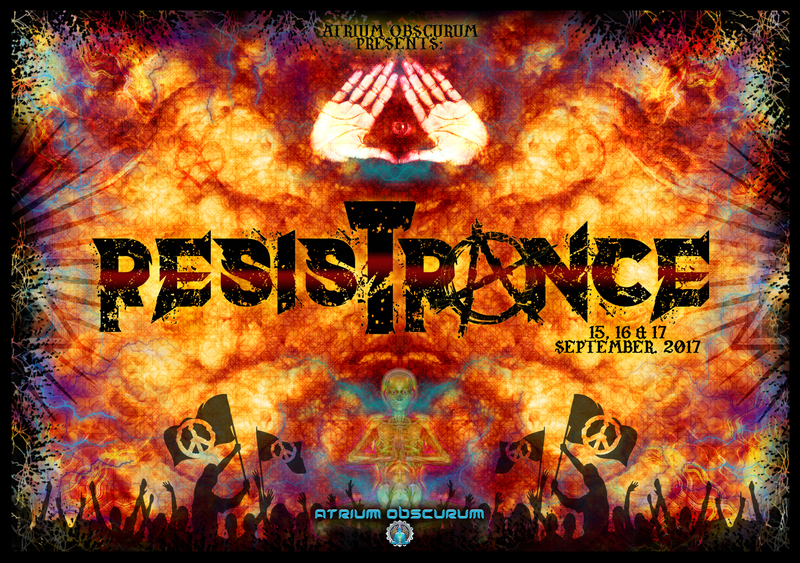 He has asked Atrium Obscurum to host his party for him, and he invites you all to join us and celebrate together. All the artists represented here were hand-picked by Chris to navigate us through this action packed, fun-filled weekend. Prepare for good times with great music and awesome people. The time we have all been waiting for is here. 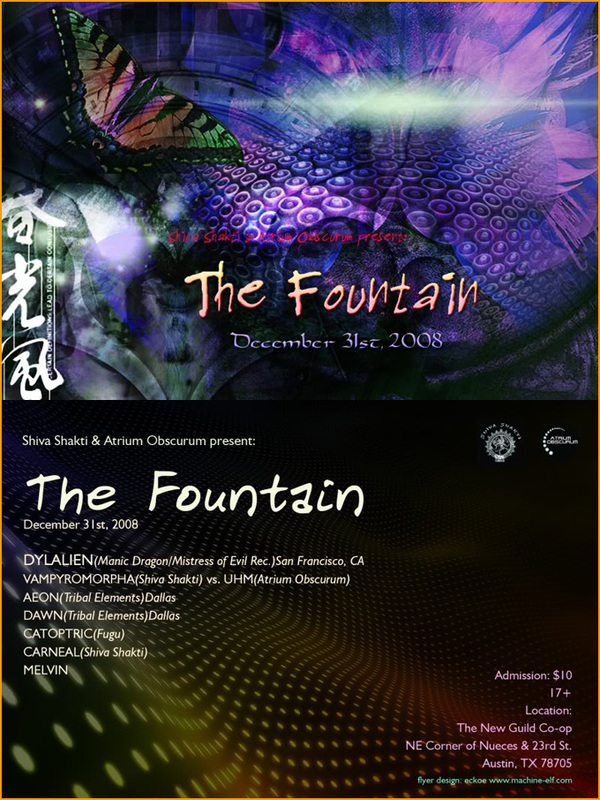 It is 2012, and for the first time in this known cycle of human history, we are experiencing our consciousness, both individual and collective, awakening through form. In ancient traditions it is believed that when a human incarnates into flesh, there is a deep amnesia that happens. This may be experienced for one’s entire life until the moment we reunite with Source at our passing. Now, we conscious fluctuations of Spirit, in our human vessels, are facing a great shift: We are, in our lifetime AND in these bodies, consciously remembering what our true essence is and has always been. We are undergoing a Cosmic Awakening where each of us are being called to experience the unbounded dimension of our True Nature while fully embracing ALL that it means to be Alive in these ephemeral vessels. The outcome of this process is a profound, transformational and irrevocable shift into Embodied Awakening. Embodied Awakening Is this very shift into a seamless unity of consciousness and matter – divinity and humanity – that deeply satisfies that longing to know and understand one’s true nature that lives at the core of every seeker. 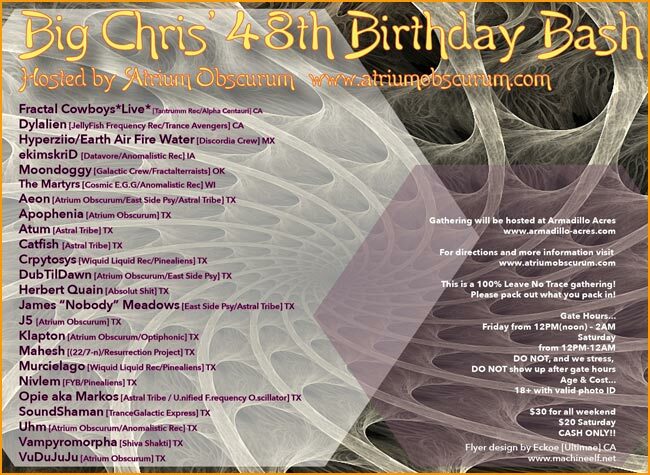 Atrium Obscurum Presents "Park Party and Potluck"
Come and hang out with us for a lovely fall day full of music,food and friends at Trinity Park In Fort Worth. Join us for some good times, with good people, while listening to good music. This ones for the kiddos, the doggies, the frisbees, the footballs, the hula hoops and whatever other things you feel like tossing around. Our intention is for this gathering to be a potluck. We encourage those who wish to attend to bring som...ething to donate to the spread. We will provide plenty of plates, plastic-ware, napkins. This gathering is BYODrinks & BYOGrill. Well I'll be hog tied, stir fried, and sun dried. 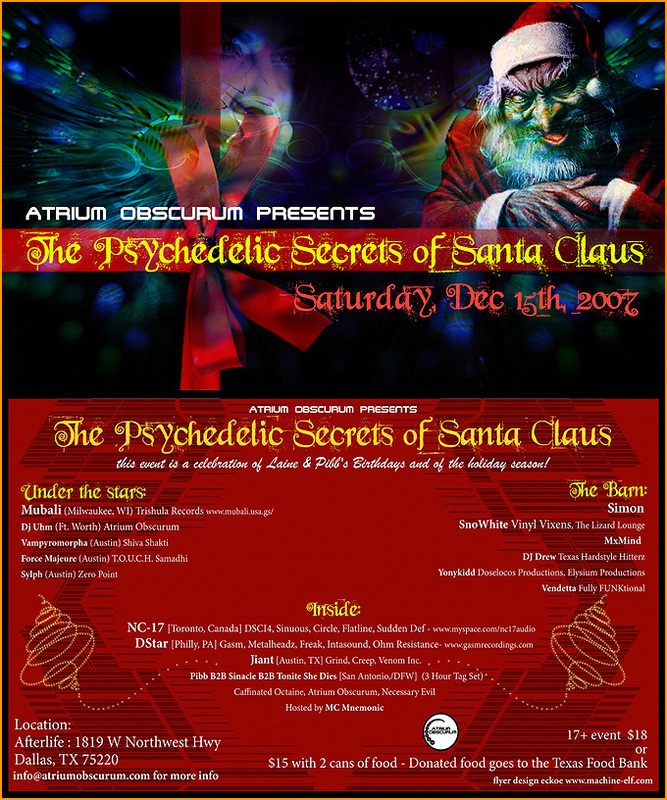 Is it time for one o' them there psychedelic soirees again? Yer darn tootin' it is! Yessiree! We're cookin' up the hospitality, visuality, and musicality Southern Style this time. Mosey on o'er yonder to our favorite waterin' hole with us once again! Strap into yer psychonautic saddle and join the posse while we work to strengthen our bonds and community tighter than a double snuggle hitch on a fortified fence post and deeper than Ol' Wise Man's well (you know the one!). Gather 'round the campfire and help us stoke the embers that illuminate our awareness and fuel our journey on this here blue and green bail o' hay we call home. Spin a yarn and raise a barn with fellow frontiersfolk old and new from far and wide. Tighten yer belts and polish yer boots and give some good ol' tender Southern Lovin' to that there meatsack you're still tryin' to tame in this here rodeo of life. There'll be a hootin' and there'll be a hollerin' alright, so load up the wagon train and c'mon down to Armadiller Acres once again for three down home days and two starry nights in the Wild Wild West. See y'all soon now, y'hear! Twenty-Ten - How was it? And the year to come - how will it unfold? Reflections of the past… Conjecture about the future… Both are intrinsically part of human nature and the conditioning we've all been exposed to. We've been taught to "learn from the past" and "prepare for the future." Useful tools when used appropriately. Nostalgia vs. anticipation. Regret vs. fear. Memory vs. prediction. Result vs. hope. All represent the dualistic nature of the seemingly infinite slices of ourselves that exist in the fourth dimension before and after…. NOW. But what ABOUT now? What IS "now?" When was the last time you thought about NOW? Don't answer that! For that very question will require you to live in the THEN! Instead, LET GO of the then, and embrace the now, NOW! As we bring in the New Year, let us remember the value of letting go of the past, submitting to the mystery of the future, and living in the moment. Every step in our true destiny lies in the choices we make in the NOW. We are not our history - in any NOW moment, we can change our entire self-paradigm simply by making a choice. Every moment in the future is a wave of superposition waiting to become the particle of the NOW, but can only become so IN the now, for one cannot observe the future. To manifest our desire - our path - our destiny, we can only do so by acting in the NOW. Living consciously in the future will only divert us from our true purpose, for we cannot predict the infinite conditional variables that may or may not allow us to manifest the NOW that we envision for our future. Whenever we live in the future, we let every passing NOW slip away. All we have is NOW. Act NOW, and the future will BECOME the now that you desire. Embrace the gift that is the divine moment. The NOW that is being given to you - NOW. We invite you, fellow fourth-dimensional wayfarers, to take advantage of the NOW in preparation for the NOW to come. At this moment; in this NOW, plant the seed of intention that, THROUGH intention, will germinate, sprout, and flourish in the immeasurable quanta of NOW moments that will span from New Year's Eve to New Year's Day, as we bring the Gregorian year 2011 from THEN into NOW. We invite you, fellow travelers, to take those moments, when THEN becomes NOW, to focus on the present. We invite you to step up to the challenge of embracing the present in this collection of NOW moments we will be receiving during our odyssey on the seas of time during the ebb and flow of the wave known as the Eve of the New Year, 2011. We invite you to see the wave not as a wave, but as individual droplets of NOW, each with its own life and opportunities. 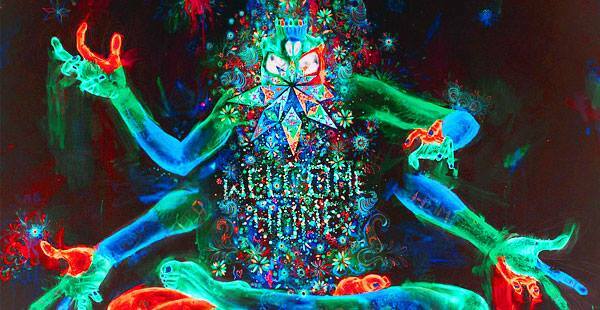 We invite you to awaken to the NOW. We invite you to take advantage of each new NOW and reinvent yourself. We invite you to take every new NOW to let go of the THEN and become who you were meant to be without the constraints of living outside of the moment. Who you are is not who you were, nor who you will be. Who you are is who you are NOW. Let go of the "Twenty-Ten" and all the years before. Submit to the mystery of the "Twenty-Eleven" and beyond. Embrace your true self, your connection to the divine Spirit, the spirits of those around you, and the gift of the NOW with US! 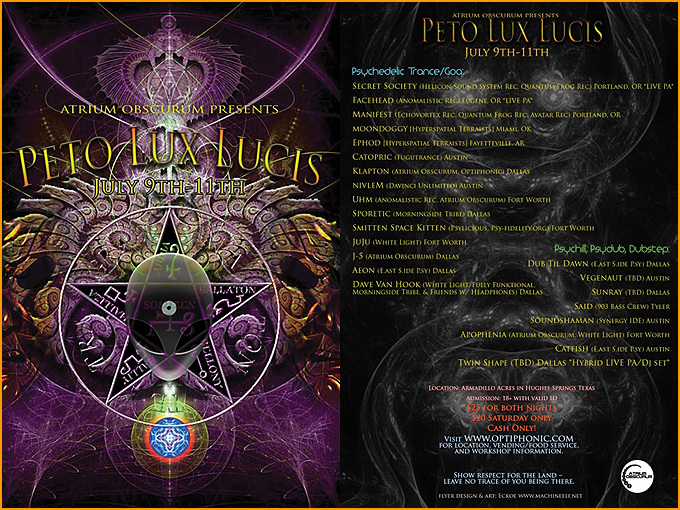 In Latin Peto Lux Lucis means “to seek the light” or “to make the light”, which for us was a fitting name for what the human race calls a secret society. Take a walk with me for a moment, as I have very important information to impart on you. My kind are not originally from your planet. We have been visiting here for many millennia blending in with your cultures. Our brethren have been biding our time, and building intentional energy to release upon the inhabitants of this planet for the benefit of all. The time is near, for the last stages of what we have been building are on the horizon. The task that we have been charged with is to spread the healing energies of love and compassion to all who inhabit this planet. We wish to help lift the veil of forgetfulness, and allow everyone the space to explore their inner truth and remember who they are. You must be strong in order to face the unknown, and know that it is your birth right to shine. Join us in spreading love and compassion to all, for We Are One. Come one, come all, come big, come small. A call rallies forth from the east. For a delightful, fanciful feast. Of knights, maidens, jesters, of kings and of queens. With fellow psychedelic, angelic figurines. The "High Quartz" beseech thee. How many days? Approximately three. Miss it not, lest ye dwell in the pillory. And why would thee abstain, have thee only half a brain? Who could resist this regal tomfoolery? Where crystalline energy will rain up to light the sky. Intentions and spirits and sounds, can you hear it? All are welcome in the Kingdom of Psy. As 2009 comes to a close we are presented with an opportunity to look back on what this year has provided for us. It has been a year that has run the gamut of emotions & what life has to offer. In our own ways we have climbed the highest of mountains and trudged through the murky depths of our being. Now we stand on the precipice of a new year. One door is closing and another one is set to open up in front of us. Throughout history cultures have looked upon New Year’s Eve in terms of a cycle/circle. So much of our lives from the smallest of scales to the largest can be seen as cycles. One of the most important of these cycles is the breath. In the Hindu language, Sanskrit, Prana is the life-breath we take in with each inhalation. It is that which balances the elements of our bodies; the energizing force of life. Apana is seen as the downward force that eliminates energy from the body. It is a purge of those things that the physical body no longer needs. If these two forces come together and enter the spinal column a beautiful fusion takes place. That fusion is kundalini, and it is that which will enliven us all. 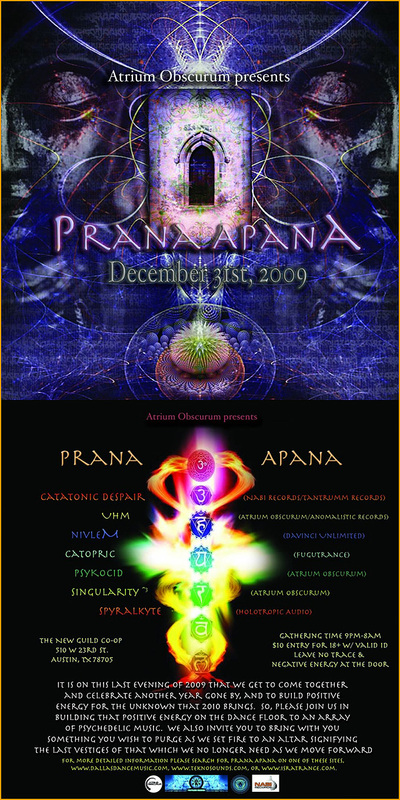 Join us as we become the joining of Prana Apana and head full on into 2010. You are embarking on a journey through space and time in a world where you create your own reality. The scales between light and the absence of light are tipping. Apathy and despair encompass this world of yours. You need to find your warrior spirit in order to fight off The Nothing that is sweeping across your land. The Southern Oracle has a message for you. This message will be lost without your imagination and your inner strength. Keep your hopes and dreams alive. Come join your fellow brothers and sisters and live out the next chapter of The Neverending Story. The theme for this event is death and creation. They both go hand in hand and the season as well as the fateful date of this gathering epitomize the theme. Come immerse yourself into the environment. You are encouraged to dress up masquerade style, or come as you are. As 2008 comes to a close and we move forward to 2009 many wish to look on our past year's experiences in retrospect. We will be providing a second altar which will be decorated by our participants with items that represent experiences in their own lives within this last year that they would like to let go of (Please bring only paper - notes, pictures, e.t.c). In the morning hours we will then set the altar ablaze and you can watch as our creation goes up in smoke. 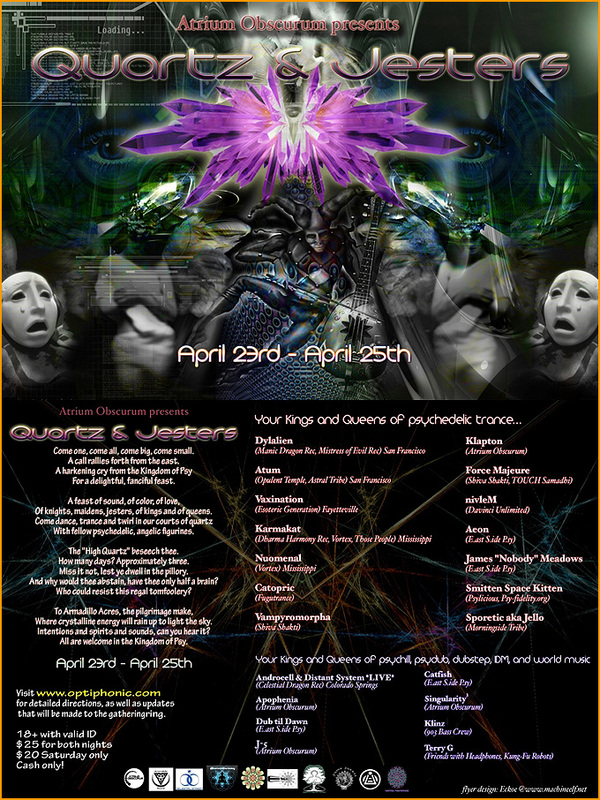 Atrium Obscurum is happy to announce the next installation of our themed outdoor psychedelic trance campouts. 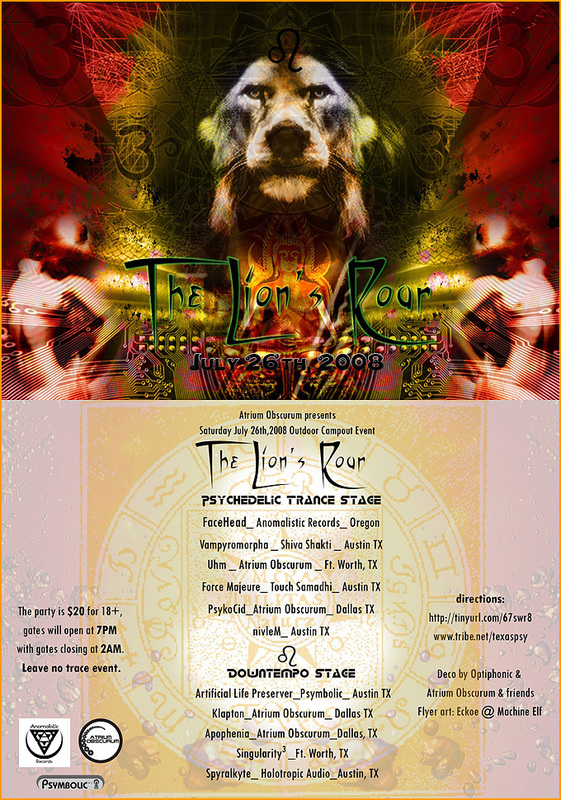 This event is a celebration of the mighty sign of the Leo in our zodiac. The Leo is the ruler of the fifth house which represents pleasure and good fortune. Joy, fun & games, and playful spirits abound in this sign that is ruled by the source of life for the universe, the Sun. Join us as we dance and play in the cuspian portion of the sign of Leo. Change starts from within and the spirit of change is infectious. Join us as we celebrate the spring solstice, as we take a positive step towards building a community, and as we celebrate the birthday of Brian "Uhm" Aldridge. The onset of the year 2008 has come with the spirit of change rushing across the consciousness of our society. There are many things that weigh heavy on the people of our country, and it is our individual responsibility to face those burdens. From global warming, to alternative fuels, to our dependency on oil, our economy, health care, political corruption, and most importantly civil rights. We all have a voice and it needs to be heard. In order to help facilitate change we will have a voter registration table setup from the beginning of the party until sometime around 1AM. Please feel free to stop by and take the first step towards making yourself heard. A celebration not only of the Holiday Season, but also the birthdays of Laine & Pibb. 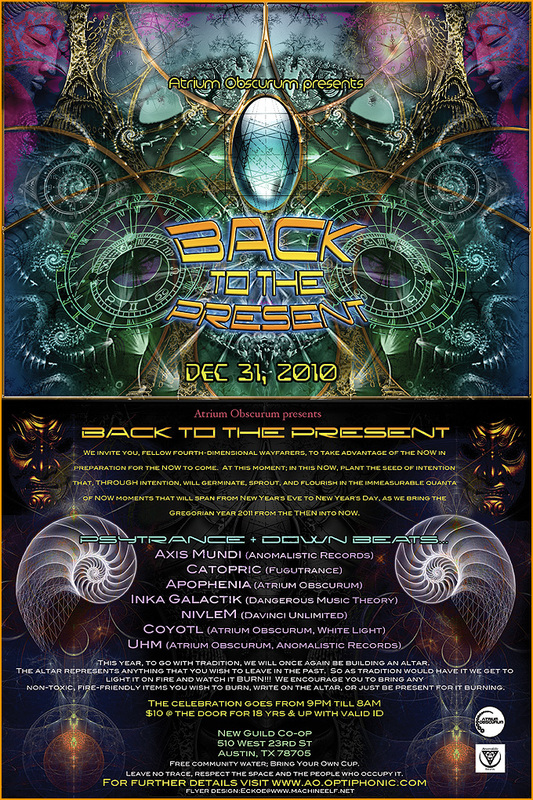 Atrium Obscurum as a crew focuses on promoting the sounds of psychedelic trance, but for this event we are also showcasing our love for DnB and the Afterlife residents & friends.